When you include Hospice of Marion County Inc in your will/trust or as a beneficiary of a retirement plan or life insurance policy, Hospice of Marion County Inc will invest the funds in the endowment with other previous gifts. A team of investment professionals manages the entire endowment. Each year, Hospice receives a distribution of approximately 5% of the value of the fund. 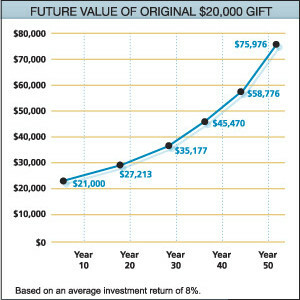 If the endowment earns an average of 8%, the additional 3% remains in the fund; thus your original gift will increase over time. 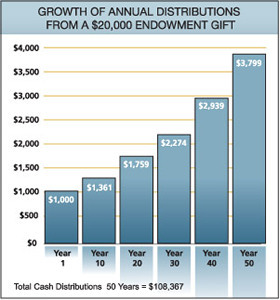 The chart on the left illustrates the growth of the annual distributions of an endowment gift under these assumptions. The 3% net growth in the fund each year means the following year there is a greater amount available to Hospice. Looking at the chart, you can see that in the tenth year the fund has grown to the point where it is able to provide $1,361 annually. Each year it will continue to grow. In year 50 it will be able to provide $3,799 dollars to support our work. All told, over the fifty years we have charted, your endowment gift of $20,000 will have distributed a total of $108,367 in annual distributions to Hospice and have grown to almost $76,000, continuing to provide needed support. Of course, this is based on the assumptions we outlined in the opening paragraph; that the fund grows at 8% each year and pays out 5% leaving 3% additional in the fund each year. The chart on the right illustrates how a gift of $20,000 to the endowment will grow, providing greater annual distributions to Hospice. The illustration assumes the same average investment rate of return of 8%, which is not a guarantee, and annual distribution to Hospice of approximately 5% that we used above.